On July 21, 2015 Sharethrough will host NATIVE 2015, with nearly 1,000 attendees confirmed. The event will feature speakers from Silicon Valley's finest — Pinterest, Box and Linkedin — as well as media darlings Reddit, VOX, Time Inc. and Business Insider. It will be held at SFJAZZ in the heart of San Francisco’s performing arts district. Ahead of NATIVE 2015, we thought it’d be fun to look back at some of the major moments from Sharethrough's previous native conferences. February 2013: The Native Ad Summit hosts 150+ people at The Standard in New York, NY. Native Advertising Summit - Care from sharethrough on Vimeo. In 2012, native advertising was barely a thing. Four years and five Sharethrough conferences later, “native advertising” is far more than a buzzword. Native is the inevitable future of how social platforms (like Pinterest and LinkedIn), content sites (like Men's Health and Forbes), apps (like MyFitnessPal) and digital media companies (like VOX) monetize. The speakers at the very first Native Ad Summit took this issue head on. Gary Vaynerchuk, a celebrity in the marketing world, spoke on the importance of brands providing value through marketing and “caring” about customers. Through conversations with MediaCom's Amy Auerbach, The Media Kitchen's Darren Herman, Yahoo's David Shing, Mashable's Todd Wasserman, the first definition of native advertising was born: ads that match the form and function of the sites that they live on. While the term was still young, native ads began to carry weight as a form of advertising that could effectively reinstall faith in online advertising as a sustainable form of monetization. June 2013: 250+ people, The W in Atlanta, GA.
Future of Native - The Native Advertising Summit - Atlanta 2013 from sharethrough on Vimeo. Now that native advertising’s foundation had been established, our next event focused on the building blocks of this new media category, emphasizing the importance of native monetization in a mobile-first world. The Atlanta native advertising summit featured industry experts from the likes of Forbes, Yahoo, Pandora and Twitter, along with Atlanta locals like 22Squared and Blinq Media. The keynote address by the ever-humble and inspiring Daryl Evans from AT&T was a clear highlight. In major news just ahead of the Summit, Yahoo launched its native in-feed ad product on mobile and desktop, Yahoo Stream Ads. With a major company introducing in-feed ads outside of Facebook and Twitter, it was clear that native advertising had moved from a concept needing to be defined to a meaningful form of digital media. November 2013: 350 people at Hotel Palomar in in Chicago, Illinois. 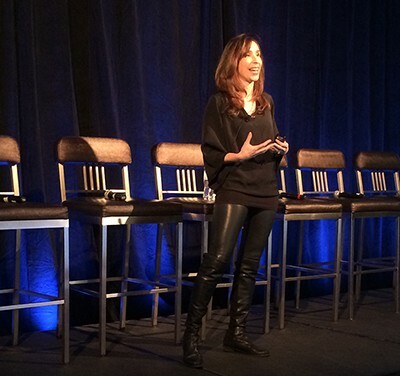 Meredith Levien, EVP Advertising, NY Times @ Sharethrough Native Ad Summit, Chicago — November 2013. Sharethrough’s third installment of the Native Ad Summit featured an all-star lineup in Chicago. Content marketing had evolved from a social media strategy to a core brand strategy and distributing brand content through native placements was on the top of every brand manager and media agency’s mind. The third Native Ad Summit highlighted stories and case studies from companies who had jumped head-first into the movement. From Buzzfeed to The Onion, Complex, and others, attendees learned about what sponsored content powerhouses were doing right (and wrong) and saw a glimpse of the future: a world where brands and publishers work together to create and curate meaningful content. Sharethrough CEO Dan Greenberg presented a dynamic argument for how the feed had become the modern design paradigm for content on the web and what that meant for brands and publishers. Greenberg made the case for how advertisers who can create meaningful, valuable content can, in the long run, win their consumer’s attention, time, and love through native advertising. A key moment arrived when The New York Times unveiled its full platform and studio dedicated to native ads. Long considered the lighthouse of the news and publishing industry, the Grey Lady had arrived to the native ad game. July 2014: 800 people at the SFJAZZ Center in San Francisco, California. Last year, we hosted the 4th Native Ad Summit at the SFJAZZ Center in San Francisco. With the terms already defined, validity proven and best practices established, it was time to figure out how to scale. From early in the day, it was clear that native was now “Silicon Valley’s” version of advertising. Presentations from Yahoo to LinkedIn continue to reiterate how business models now revolved heavily around branded content and native monetization. For most modern startups and platforms, monetizing with banners, pre-rolls and popups has been simply a non-starter. From Pinterest Promoted Pins, to LinkedIn Sponsored Updates, to Twitter Promoted Tweets, Facebook News Feed Ads and Instagram Promoted Photos, every modern Silicon Valley platform employs native-first, and native-only monetization. With the wind at their back, the product managers, platform strategists, editors, brands, and developers of Silicon Valley discussed the new ways to build native ad programs that could not only be creative but completely automated. It's Easy If You Mean It from sharethrough on Vimeo. July 2015: 1,000 people at the SFJAZZ Center in San Francisco, California. At this year's conference, the focus will be on the leaders in the space continuing to drive the market forward. We're rebranding the Native Ad Summit as NATIVE 2015, but this is about more than just a name change. We're creating an event that better reflects the expanding scope of the word native advertising for publishers, advertisers, marketers, and investors alike. Industry leaders continue to make native a core part of their monetization strategies, whether they're launching a new app, social platform or news site. With a more diverse cast that spans technology and media, talks will go beyond content marketing and tackle real issues that entrepreneurs, founders and businesses face everyday. Today’s companies are faced with difficult product and business decisions, and this year's speakers will provide insight and inspiration to (hopefully) make those decisions a little easier.